We either kept a teenage driver in the car, or we had an adult in the passenger side with younger drivers. We like having the option. 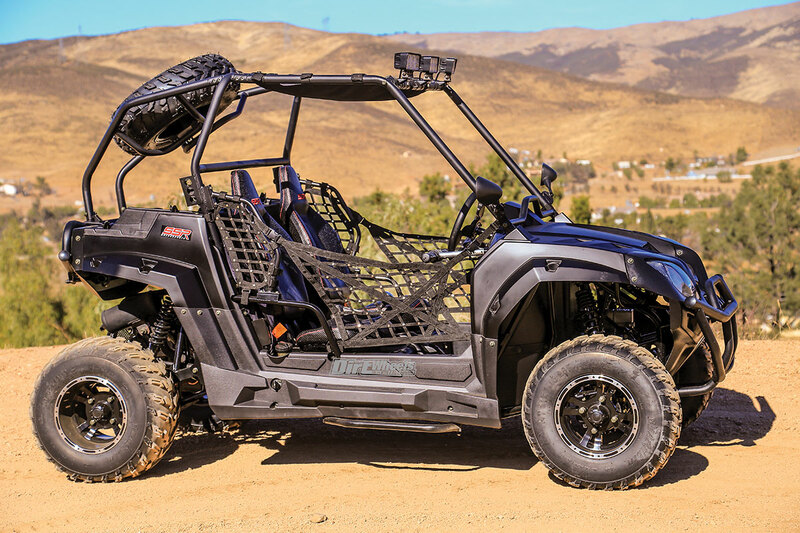 SSR Motorsports has a very wide variety of off-road and on-road vehicles that it sells, but among the myriad of offerings, the SSR SRU170RS is the sole UTV. 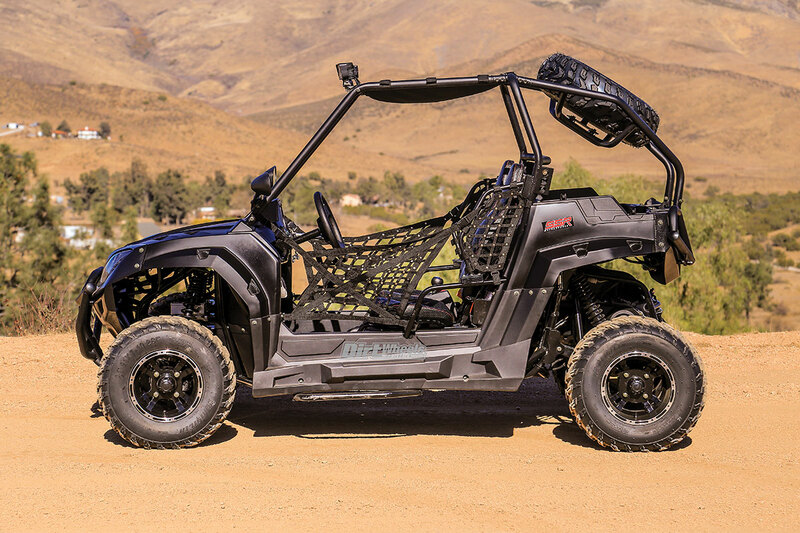 In design and concept it is much like the popular Polaris Ace 150 and RZR 170. Motivation is basic—an air-cooled engine with a belt-drive CVT that transfers power to a 2WD chain final drive. The entire power package, rear axle, rear disc and drive sprocket are all mounted on the rear swingarm. In other words, as the rear wheels cross bumps, they must react with the engine and drivetrain as unsprung weight. 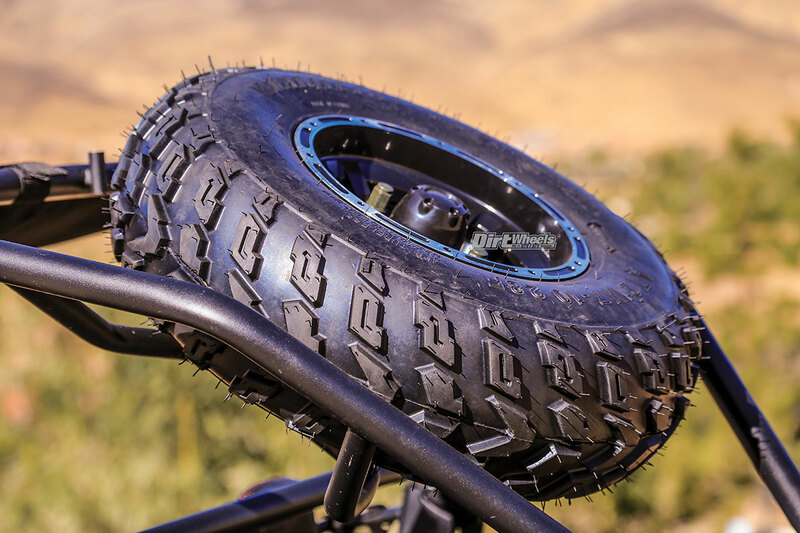 Generally, that much unsprung weight would cripple the suspension’s ability to handle bumps, but the concept actually works quite well in this case. In the front, the SRU170SR has normal A-arms and shocks. Very trick Kings air shocks are an option, but they add $1500 to the price tag. Like many offerings from the Asian market, the SSR comes with a stunning level of standard equipment. In addition to normal headlights, the SSR has three LED lights mounted on the roll cage, a canvas soft top, a spare tire, five cast-aluminum wheels, a horn, tie-down hooks in the bed and door nets. There are even monogrammed seats with “SSR” embroidered into the material. The SSR comes very well-equipped, and that includes this cage-mounted spare wheel. Under the rear deck is a relatively basic, 170cc, air- and oil-cooled motor. It has an impressive amount of boost and response. Power is delivered via a CVT that has a simple forward, neutral and reverse transmission. Actually, reverse isn’t that simple. You must hold the brake pedal (a wise plan anyway) to engage reverse. Even then, you must hold the shifter lightly towards you while you gently engage the gas pedal. Then, reverse engages. Reverse has much lower gearing than forward, so the SSR is a bit jumpy in reverse. In the desert with lots of room, our young drivers had no problem with it. In tighter confines, it intimidated some. 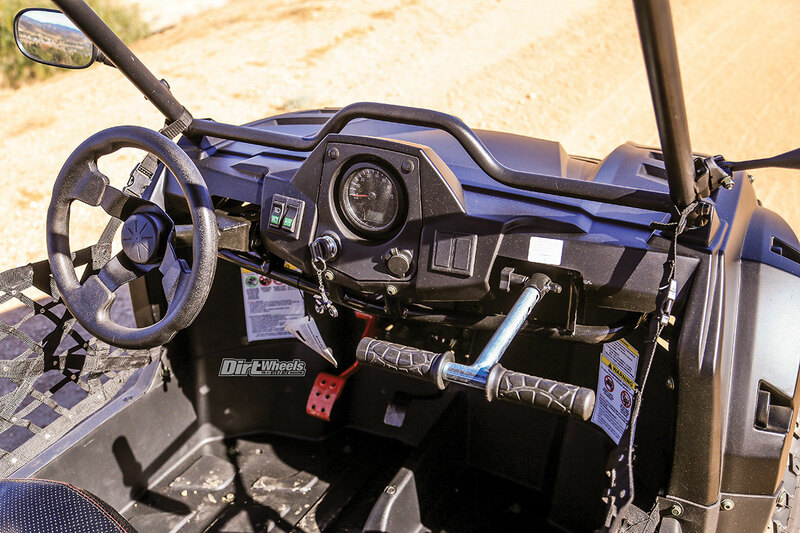 Since the SRU170RS’ CVT only includes F/N/R, you must engage the hand-actuated brake lever on the center console below the shifter when parking. The parking brake is powerful and effective, so trying to drive with the parking brake on is difficult at best. It is gated, so it is easy to lock or to release. The SSR SRU170RS has normal headlights and these LED lights on the cage. 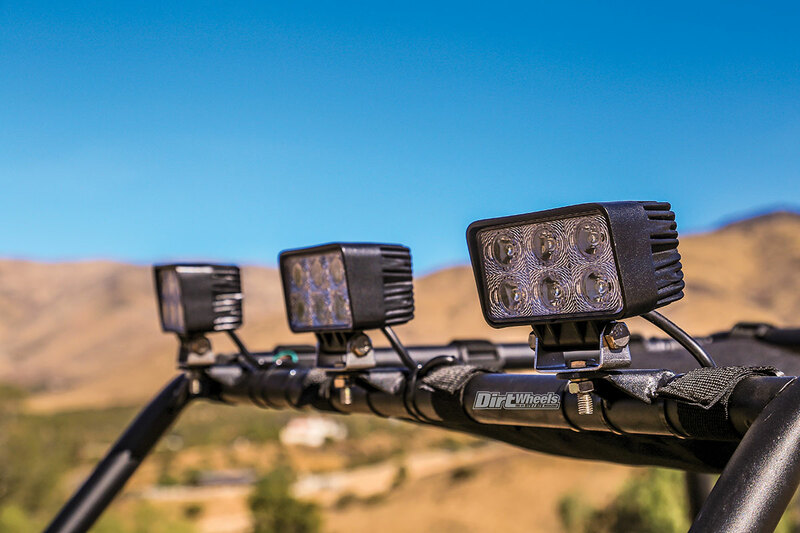 It has plenty of light for night rides. Although there is engine braking for as long as the CVT is engaged, it is mild. When you let off the throttle, you have engine braking until the engine drops below the rpm that engages the CVT, then the SSR all but freewheels. That isn’t a big deal. The four-wheel hydraulic disc brakes (two in the front and one on the rear axle) engage smoothly yet have plenty of power for the weight and size of the machine. Unlike some youth-oriented machines, the SSR does have a speedo, though it is calibrated in kilometers with mph in much smaller numbers. That means that more experienced drivers are seeing over 50 on the speedo even though it actually doesn’t go over the claimed top speed of 35 mph unless it is going down hill. Parents can take some comfort in the roll cage, seat belts and side nets. The seat belts are easy to operate, but smaller drivers struggled to clip the nets in place. Even with two passengers inside, the 170 climbs surprisingly well. It pulls fine with an adult inside as well. One of our favorite facets of the SSR is that an adult can fit in the passenger side to supervise the youth driver. We had adults that were 6-foot-2 and over 230 pounds on the passenger side. Folks that tall have a tough time driving the SSR, but they fit on the passenger side. Smaller adults are able to drive or ride as a passenger. You are not able to restrict the speed, but there is a screw to restrict the gas pedal travel. Engine performance is very good for a 170cc engine pushing a 540-pound machine. Even when we had 300 pounds’ worth of driver and passenger, the little machine climbed well. Fuel economy is claimed to be 45 mpg. We didn’t check that religiously, but we are sure that the sub-3-gallon tank provides miles of smiles. There is no fuel gauge, but there is a fuel petcock on the right side exterior of the machine below the gas cap. It has off, on and a reserve setting. Even very short adults pretty much ran the seats all the way back, but some younger drivers were happy that the driver’s seat is adjustable forward. 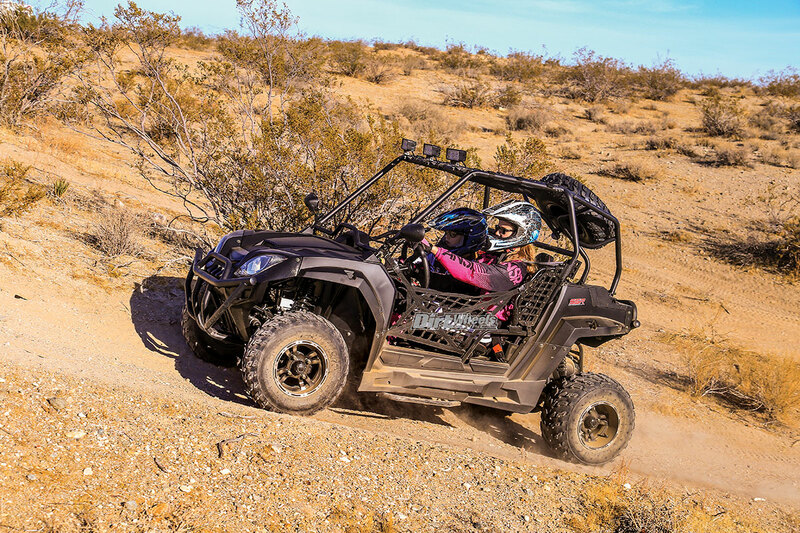 On some other youth UTVs we stayed strictly away from sand and steep grades, but the SSR has surprising climbing ability, especially with a single occupant or when both the driver and passenger are youths. None of our drivers noticed the lack of electric power steering, but that is more than likely because they have never experienced it. The interior is quite well appointed with real gauges. The switches are real, and the machine even has a horn. The grab bar doubles as a lug wrench. The fit and finish of the machine is nice. Young drivers seemed to appreciate it, and there are no graphics at all to get ratty-looking. On the dash is the headlight switch that controls the headlights and the LED lights on top. You actually can pilot this machine safely after sundown. There is a horn button and a 12-volt power port. It also has a tilt-wheel feature. 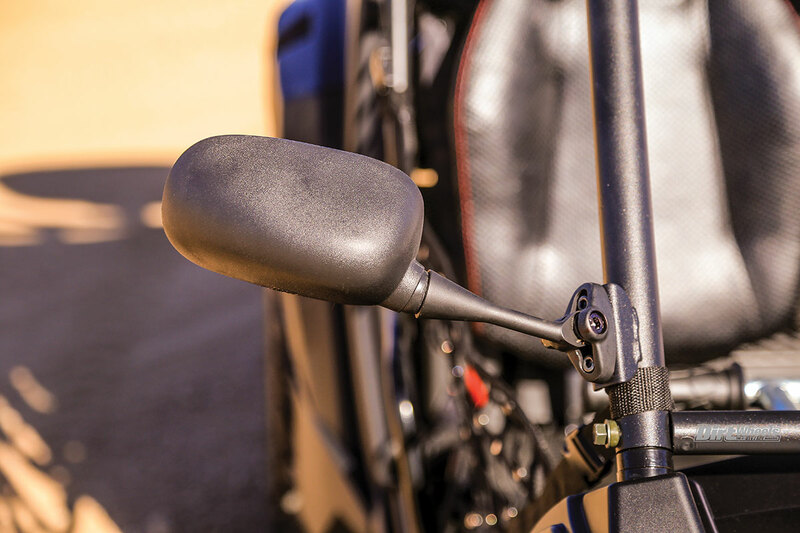 There are mirrors on each side, and there is a nice adjustable grab bar on the passenger side. Remove it and it does double duty as a lug wrench—handy since there is a cage-mounted spare wheel. We took the SSR to the desert for a long weekend, and our four youth drivers managed to put 145 kilometers on the odometer. At the end of the weekend that put the total on the machine at almost 300 kilometers, and it still felt tight and new. There was one exception—the air filter case is mounted on the engine, and that put it right in the dust stream from the front wheels. It started running funny at 200 kilometers. A check of the filter proved it was a disaster. Three cleanings later and it was oiled and back in the machine. It ran perfectly again. The rear suspension employs a swingarm, so the engine and drive move up and down with the swingarm. It is a chain final drive. Suspension action on the SSR is quite good, and our youth and one of the mothers (who is an experienced off-roader) pronounced the machine stable. One of the dads drove it and commented that he was bottoming the suspension, but none of the adults noted a problem with a youth driver and an adult in the passenger side supervising. The ignition key is in a handy spot to kill the engine if things get touchy. We have a small trailer that packs two sport quads sideways, and we were able to (barely) put the SRU170RS on it long ways. The trailer handled the modest weight fine, though we backed it on to keep the majority of the poundage on the tongue. 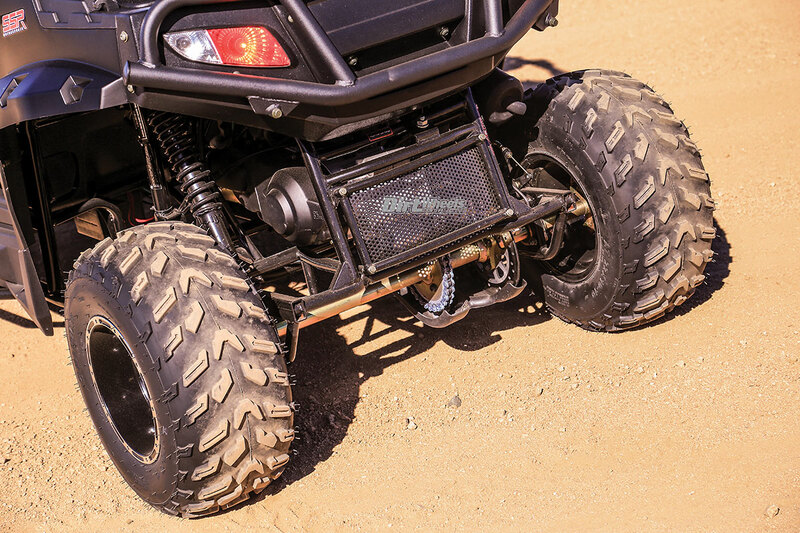 The SSR doesn’t weigh much more than a single sport quad and less than most 4×4 quads. It should fit in any truck, but will be too long for some of the new short-bed trucks, even with the gate down. All machines should come with mirrors, and the SSR has them on both sides. 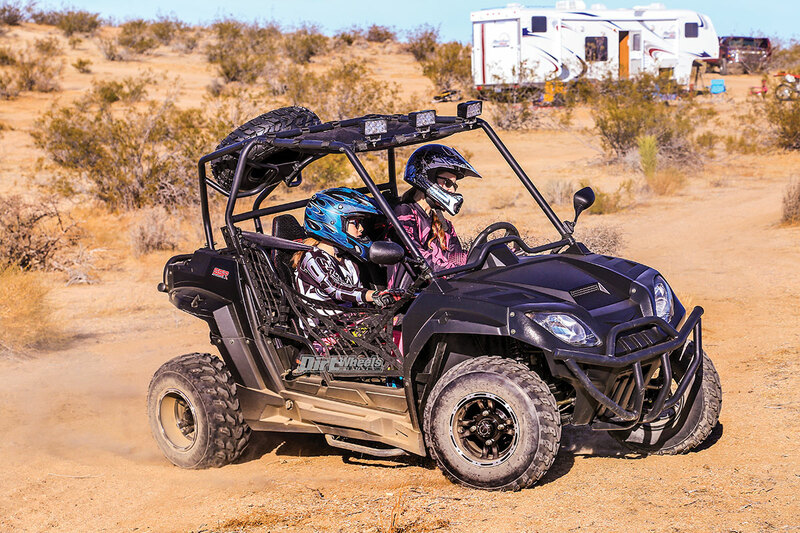 No doubt the novelty of the small UTV helped, but our youth drivers never tired of the machine. Some did take stints on quads or dirt bikes, but more because the SSR was occupied. We like that an adult can go along to supervise if needed, and in relative comfort. All of the moms and grandmothers fit in the machine comfortably. Small adults who were new to off-road also had a blast. This is a small but fun and very capable machine. The SSR 170 is made for youth drivers, but at just over 8 feet long, a parent can ride in the passenger side to supervise.